Home guest articles	Gluten-Free Pizza: Worth Its Weight In Carbs? It’s the long weekend here in Canada and you might be looking for some party foods to help celebrate. If you’ve got a gluten allergy or sensitivity, you may be missing party favourite foods like beer and pizza. Today Renee Varney may have some good news for you! Whether you’ve been formally diagnosed with celiac disease or not, being sensitive to gluten is no walk in the park. In the developed world, many common foodstuffs contain wheat or wheat byproducts and thus wreak havoc on those with gluten allergies. The foodie community has applauded recent advances in gluten-free cuisine, from rice beer to tortilla chips, but perhaps the most exciting development comes courtesy of a food that generates endless amounts of controversy. That’s right: gluten-free pizza has officially arrived. Whether it’s worth eating is a call you’ll have to make for yourself. The world of pizza restaurants has seen an explosion of gluten-free options since the late 2000s. Fresh Brothers, a regional pizza chain based in diet-conscious California, made waves by being the first major operator to offer a consistent gluten-free menu. The chain’s immediate success encouraged other West Coast chains to pile on shortly thereafter, and the region remains the undisputed gluten-free capital of the United States. Nothing good can stay secret for long, though, and national players soon entered the fray. Surprise entries like Atlanta-based Godfather’s Pizza, known more for its political activities than any cutting-edge culinary vision, jostled for position alongside national behemoths like Michigan-based Domino’s. Fortunately, the market for gluten-free pizza is big and continues to grow: The National Foundation for Celiac Awareness estimates that three million Americans are sensitive to gluten, and thousands more are diagnosed every year. Today, you can find gluten-free pizza in most chain restaurants of any size. In the words of the late Chris Farley, it’s easy to slap a guarantee on a product. When it comes to gluten-free pizza, you’d probably like more than vague assurances of gluten-free dough and “minimal cross-contamination.” The National Foundation for Celiac Awareness can help in this department: it rates national pizza chains according to the content of their dough and the training their employees receive regarding safe handling procedures. Despite its ubiquity, Domino’s ranks pretty low on these two metrics since it lacks a dedicated gluten-free manufacturing facility and its prep areas aren’t always free of wayward gluten particles. In fact, the chain goes so far as to discourage celiac sufferers from eating there and recommends it to those trying to lower their carbs. By contrast, the Chuck E. Cheese’s children’s entertainment franchise and Godfather’s both use gluten-free manufacturing facilities and do their best to ensure that cross-contamination doesn’t occur during cooking. Of course, consumers like you are needed to give the final verdict on any so-called gluten-free pizza. If you’re adventurous enough to try Domino’s new crust, you’ll be in good company: the menu option has sold briskly during its first months of release. More importantly, it also scored higher than the traditional crust on a subjective taste test conducted on non-celiac sufferers by the chain itself. Alternatively, the Glutino line of gluten-free doughs includes pre-prepared frozen pizzas, frozen crusts, and pizza-like breadsticks and cheesy breads for at-home gluten-free pleasure. You’ve suffered under the tyranny of your gluten sensitivity long enough. The rapidly-growing availability of gluten-free pizzas both in restaurants and grocery-store freezer aisles is a testament to the wonders of culinary technology. Renee Varney is a freelance blogger, who occasionally writes for deliv-ery.com–a site she loves using to find Local Pizza Delivery Order Restaurants Online. 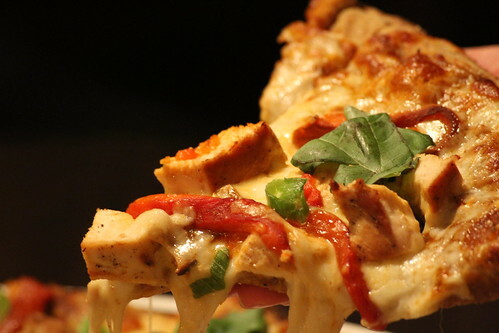 Have you tried any of these gluten-free pizza options Renee blogged about today? Will you be trying any of them for Canada Day and July 4th celebrations?